The snowy, craggy ascent to the top of Toubkal in the Atlas Mountain range. The Kingdom of Morocco is one of the North African countries in the region known as the Maghreb. The country is bordered by Spain, Algeria, Mauritania, and Western Sahara. Morocco stretches from the Atlantic Ocean through the mountainous regions into the Sahara Desert. The country, besides France and Spain, is the only one with both the Mediterranean and Atlantic coastline. Morocco is considered a mountainous country because of the several rugged mountains formed in the country. The Atlas and the Rif Mountains characterize the highest mountains in Morocco. The Atlas Mountains are found in the center and southern parts of Morocco while the Rif Mountains border the Mediterranean Sea. These high mountains are looked at below. Toubkal is the highest mountain in Morocco, as well as the highest peak in the Atlas Mountains, at 13,671 feet above sea level. It is also the highest peak in North Africa. Toubkal, an ultra prominent peak, is located within the Toubkal National Park, 63 kilometers south of Marrakesh. The peak is frequented by climbers who form the larger portion of tourists visiting the area. 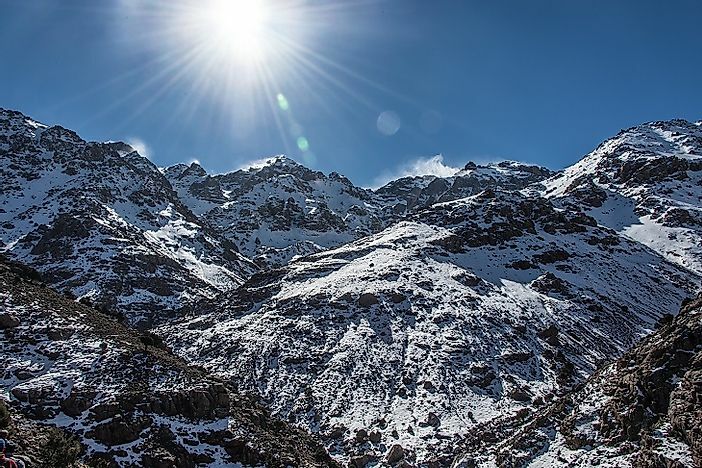 Toubkal was first ascended on in 1923 by Marquis de Segonzac, a European climber but the chances are that the mountain might have been climbed earlier. Currently, there are guides and porters who help the climbers to get up the mountain. The mountain is steep and slippery thus climbers are warned to be cautious while climbing. To access the summit of Toubkal, climbers have to go through the Village of Aroumb, floodplains, and valleys. Climbers and trekkers to this mountain also enjoy the beautiful scenes of Sidi Chamharouch, Muslims shrines, and the old stone-build refuges. Ouanoukrim is the second highest peak in the Atlas Mountains and is located to the south of Marrakesh. The peak has an elevation of 13,415 feet and has two summits, Ras Ouanoukrim and Timzguida, which also form part of the three highest peaks of the Atlas Range. There is no evidence of any earlier ascent on Ouanoukrim Mountain before the 1924 ascent by the European climbers. The mountain is opened for tourist all year round with no permits or fees charged. Ouanoukrim Mountain receives fewer visitors during summer because of the high temperatures, especially on the southern side. Ouanoukrim also offers a perfect camping site for those visiting the area. M'Goun is also one of the peaks forming the Atlas Range. With an elevation of 13,356 feet, M'Goun is the fourth highest peak within this range after Toubkal, Timzguida, and Ras Ouanoukrim. The M'Goun is an ultra prominent peak found within the Draa-Tafilalet region of Morocco. The mountain is an attractive trekking destination because of the river gorges and the remote Berber villages surrounding it. The Berber village, constructed with earth from the mountain, is a major tourist attraction considering that the mountain is not popular with climbers. Local Berber guides are always on hand to assist tourists who visit the area. The Berber guides also carry languages and offer cooking services to the tourists visiting the site. M'Goun is also a camping site for both locals and foreign tourists. The Atlas and Rif Mountain Ranges are filled with major tourist destinations, earning the country a great deal of revenue. As a result of their significance, the government of Morocco has invested in the development and improvement of the trekking circuits. The government has also declared these areas protected under the Environmental Laws.